Radioiodine remnant ablation (RRA) is considered a safe and effective method for eliminating residual thyroid tissue, as well as microscopic disease if at all present in thyroid bed following thyroidectomy. The rationale of RRA is that in the absence of thyroid tissue, serum thyroglobulin (Tg) measurement can be used as an excellent tumor marker. Other considerations are like the presence of significant remnant thyroid tissue makes detection and treatment of nodal or distant metastases difficult. Rarely, microscopic disease in the thyroid bed if not ablated, in the future, could be a source of anaplastic transformation. On the other hand, microscopic tumor emboli in distant sites could be the cause of distant metastasis too. The ablation of remnant tissue would in all probability eliminate these theoretical risks. It may be noted that all these are unproven contentious issues except postablation serum Tg estimation that could be a good tumor marker for detecting early biochemical recurrence in long-term follow-up strategy. Radioactive iodine is administered as a form of "adjuvant therapy" for remnant ablation. There have been several reports with regard to the administered dose for remnant ablation. The first report of a prospective randomized clinical trial was published from India by a prospective randomized study conducted at the All India Institute of Medical Sciences, New Delhi in the year 1996. The study reported that increasing the empirical 131 I initial dose to more than 50 mCi results in plateauing of the dose-response curve and thus, conventional high-dose remnant ablation needs critical evaluation. Recently, two important studies were published: One from French group and the other from UK on a similar line. Interestingly, all three studies conducted in three different geographical regions of the world showed exactly similar conclusion. The new era of low-dose remnant ablation has taken a firm scientific footing across the continents. 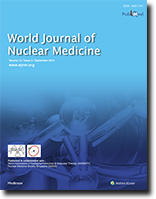 High-quality image is necessary for accurate diagnosis in nuclear medicine. There are many factors in creating a good image and detector is the most important one. In recent years, several detectors are studied to get a better picture. The aim of this paper is comparison of some type of these detectors such as thallium activated sodium iodide bismuth germinate cesium activated yttrium aluminum garnet (YAG: Ce) YAP: Ce "lutetium aluminum garnet activated by cerium" CRY018 "CRY019" lanthanum bromide and cadmium zinc telluride. We studied different properties of these crystals including density, energy resolution and decay times that are more important factors affecting the image quality. The collimator in single-photon emission computed tomography (SPECT) is a critical component of the imaging system and plays an impressive role in the imaging quality. 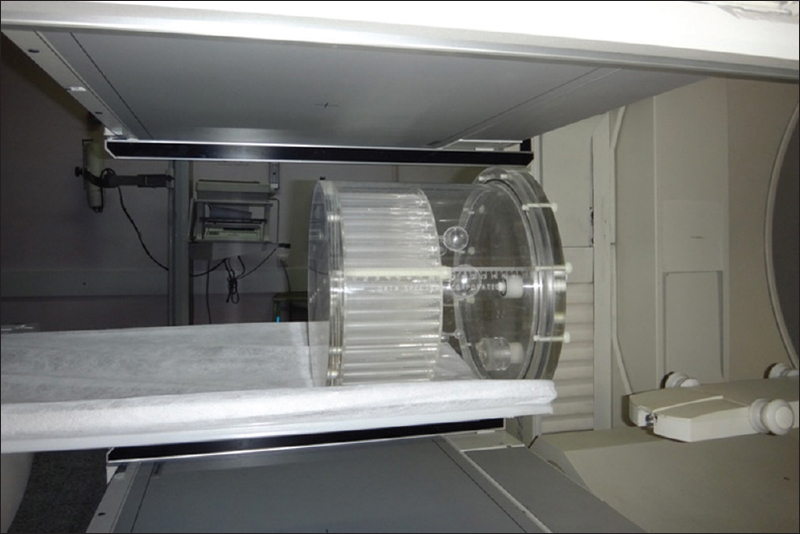 In this study, the effect of the collimator material on the radioisotopic image and its functional parameters was studied. The simulating medical imaging nuclear detectors (SIMIND) Monte Carlo program was used to simulate a Siemens E.CAM SPECT (Siemens Medical Solutions, Erlangen, Germany) system equipped with a low-energy high-resolution (LEHR) collimator. The simulation and experimental data from the SPECT imaging modality using 99m Tc were obtained on a point source and Jaszczak phantom. Seventeen high atomic number materials were considered as LEHR collimator materials. In order to determine the effect of the collimator material on the image and functional parameters, the energy resolution, spatial resolution, contrast, and collimator characteristics parameters such as septal penetration and scatter-to-primary ratio were investigated. 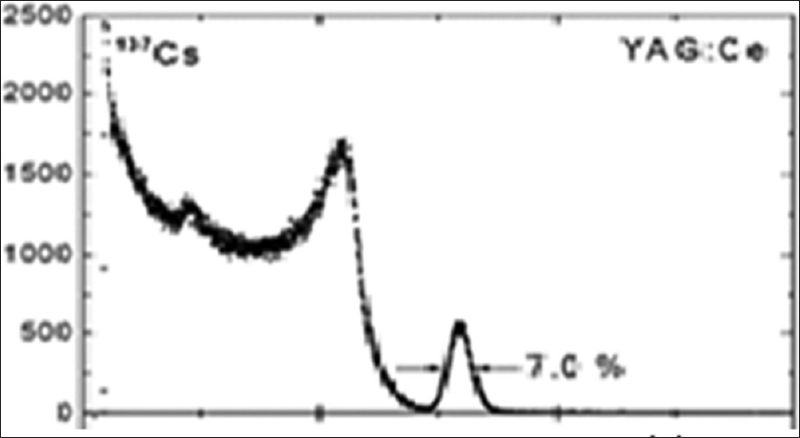 Energy spectra profiles, full width at half maximums (FWHMs) (mm) of the point spread function (PSF) curves, system sensitivity, and contrast of cold spheres of the Jaszczak phantom for the simulated and experiment systems have acceptability superimposed. The results of FWHM and energy resolution for the 17 collimators showed that the collimator made of 98% lead and 2% antimony could provide the best FWHM and energy resolution, 7.68 mm and 9.87%, respectively. The LEHR collimator with 98% lead and 2% antimony offers the best resolution and contrast when compared to other high atomic number metals and alloys. Dose calibrator linearity testing is indispensable for evaluating the capacity of this equipment in measuring radioisotope activities at different magnitudes, a fundamental aspect of the daily routine of a nuclear medicine department, and with an impact on patient exposure. The main aims of this study were to evaluate the feasibility of substituting the radioisotope Fluorine-18 ( 18 F) with Technetium-99m ( 99m Tc) in this test, and to indicate it with the lowest operational cost. The test was applied with sources of 99m Tc (62 GBq) and 18 F (12 GBq), the activities of which were measured at different times, with the equipment preadjusted to measuring sources of 99m Tc, 18 F, Gallium-67 ( 67 Ga), and Iodine-131 ( 131 I). Over time, the average deviation between measured and expected activities from 99m Tc and 18 F were, respectively, 0.56 (±1.79)% and 0.92 (±1.19)%. The average ratios for 99 m Tc source experimental activity, when measured with the equipment adjusted for measuring 18 F, 67 Ga, and 131 I sources, in real values, were, respectively, 3.42 (±0.06), 1.45 (±0.03), and 1.13 (±0.02), and those for the 18 F source experimental activity, measured through adjustments of 99m Tc, 67 Ga, and 131 I, were, respectively, 0.295 (±0.004), 0.335 (±0.007), and 0.426 (±0.006). The adjustment of a simple exponential function for describing 99m Tc and 18 F experimental activities facilitated the calculation of the physical half-lives of the radioisotopes, with a difference of about 1% in relation to the values described in the literature. 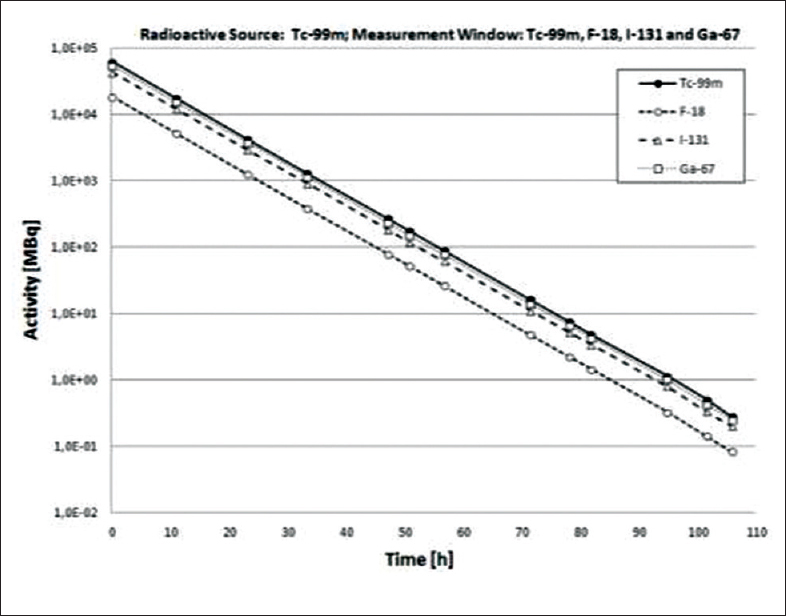 Linearity test results, when using 99m Tc, through being compatible with those acquired with 18 F, imply the possibility of using both radioisotopes during linearity testing. 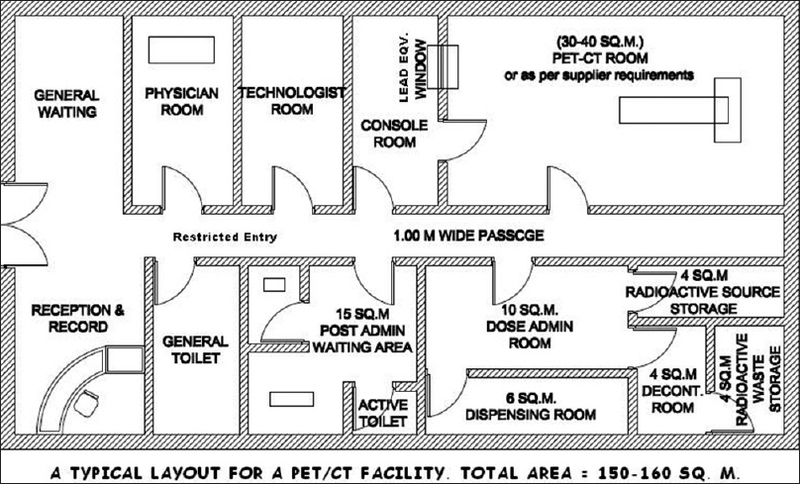 Nevertheless, this information, along with the high potential of exposure and the high cost of 18 F, implies that 99m Tc should preferably be employed for linearity testing in clinics that normally use 18 F, without the risk of prejudicing either the procedure itself or the guarantee of a high-quality nuclear medicine service. The goal was to improve Alzheimer's 2-deoxy-2- 18 F-fluoro-D-glucose ( 18 F FDG)-positron emission tomography (PET)/computed tomography (CT) imaging through application of a novel, hybrid Fourier-wavelet windowed Fourier transform (WFT) restoration technique, in order to provide earlier and more accurate clinical results. General Electric Medical Systems downward-looking sonar PET/CT 16 slice system was used to acquire studies. Patient data were acquired according the Alzheimer's disease Neuroimaging Initiative (ADNI) protocol. Here, we implemented Fourier-wavelet regularized restoration, with a Butterworth low-pass filter, order n = 6 and a cut-off frequency f = 0.35 cycles/pixel and wavelet (Daubechies, order 2) noise suppression. 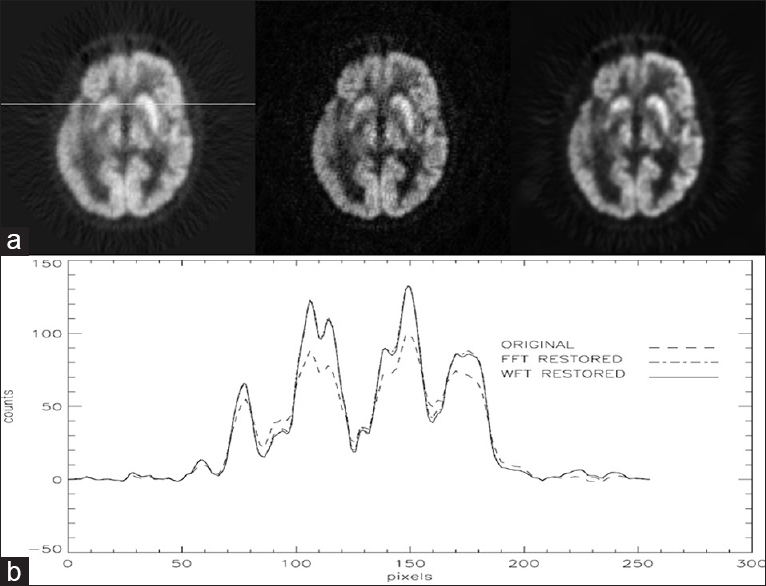 The original (PET-O) and restored (PET-R) ADNI subject PET images were compared using the Alzheimer's discrimination analysis by dedicated software. Forty-two PET/CT scans were used in the study. They were performed on eleven ADNI subjects at intervals of approximately 6 months. The final clinical diagnosis was used as a gold standard. For three subjects, the final clinical diagnosis was mild cognitive impairment and those 13 PET/CT studies were not included in the final comparison, as the result was considered as inconclusive. Using the reminding 29 PET/CT studies (23 AD and 6 normal), the sensitivity and specificity of the PET-O and PET-R were calculated. The sensitivity was 0.65 and 0.96 for PET-O and PET-R, respectively, and the specificity was 0.67 and 0.50 for PET-O and PET-R. The accuracy was 0.66 and 0.86 for PET-O and PET-R, respectively. The results of the study demonstrated that the accuracy of three-dimensional brain F-18 FDG PET images was significantly improved by Fourier-wavelet restoration filtering. This prospective clinical study aimed at assessing three pulmonary scintigraphic algorithms to detect acute pulmonary embolism (PE): Lung ventilation/perfusion (V/Q) scintigraphy along with modified prospective investigation of pulmonary embolism diagnosis (PIOPED) criteria; lung perfusion scintigraphy along with prospective investigative study of acute pulmonary embolism diagnosis (PISAPED) criteria; and lung perfusion scan in combination with ventilation scan, along with modified PISAPED criteria, which were newly developed. Patients with suspicion of PE were eligible for this study if they had no abnormal chest x-ray. Their diagnostic workup included a clinical assessment, a pulmonary V/Q scintigraphy, and CT pulmonary angiography (CTPA), as well as a clinical outcome assessment over a period of 24 weeks. Referred to the final clinical diagnosis of patients, the sensitivity and specificity of each algorithm were evaluated. The diagnostic performance of each algorithm by the area under the maximum likelihood fitted receiver operating characteristic (ROC) curve was determined. With respect to the PISAPED criteria, the sensitivity was 60.8% and specificity was 87.3%. No patient was classified into nondiagnostic category. The PIOPED criteria showed that the sensitivity was 95.0% and specificity was 88.2%, while 57.4% of the patients were in nondiagnostic category. The areas under the ROC curve constructed from the PISAPED criteria results and the modified PIOPED criteria results were 0.734 and 0.859 (P < 0.01), respectively. The modified PISAPED criteria demonstrated that the sensitivity was 83.8% and specificity was 89.1%. No patient was classified into nondiagnostic category. The area under the ROC curve constructed from modified PISAPED criteria was 0.864 (P < 0.01). 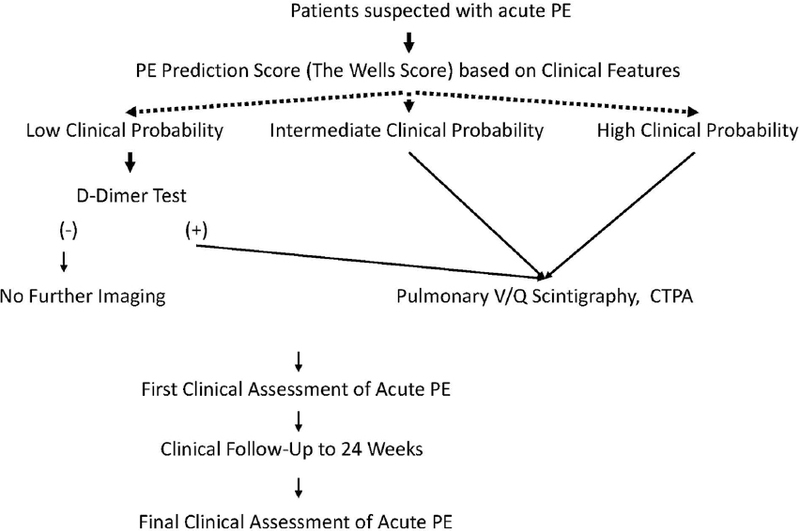 Perfusion scans used with ventilation scans and modified PISAPED criteria may increase the diagnostic accuracy of pulmonary scintigraphy for acute PE, compared with the two major algorithms. 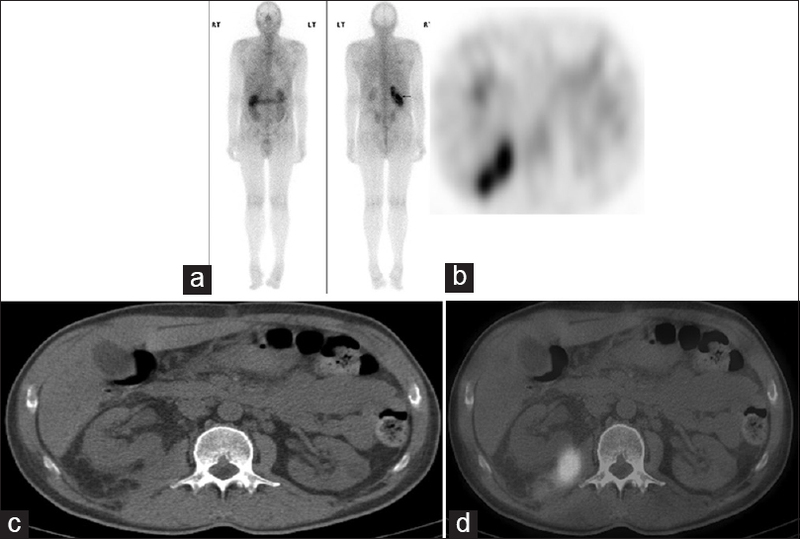 To assess the added value of single-photon emission computed tomography/computed tomography (SPECT/CT) in patients with end-stage renal failure (ESRF) or renal transplant recipients in whom focal infection was suspected. Gallium-67 (Ga-67) citrate scintigrams of 18 patients (10 in ESRF and eight with renal transplants) were reviewed. Sites of abnormal uptake seen on the whole body and SPECT were noted. A SPECT/CT was also reviewed to see if additional information could be obtained. 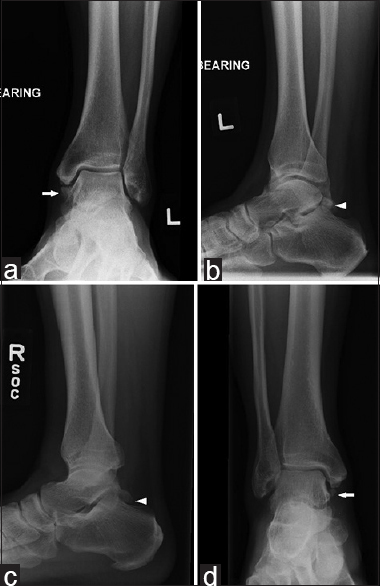 Imaging results were compared with the final diagnosis. Overall, 14 out of 18 (78%) patients had a proven cause to explain symptoms while four patients did not have a final cause identified. Infection was proven in the final diagnosis in 12 out of 14 (86%) patients. Of the 10 patients with ESRF, six had confirmed infection with the Ga-67 citrate study correctly identifying five out of six (83%) patients, and SPECT/CT providing additional information in four out of five (80%) patients. In the eight renal transplant recipients, six had a confirmed source of infection (all identified by the Ga-67 citrate study). SPECT/CT provided additional information in two out of six (33%) patients. Ga-67 citrate imaging had an overall sensitivity of 13/14 (93%), with one false negative. SPECT/CT provided an additional contribution in eight out of 18 (44%) patients by better defining the location/extent of infection and differentiating the physiological from the pathological uptake. 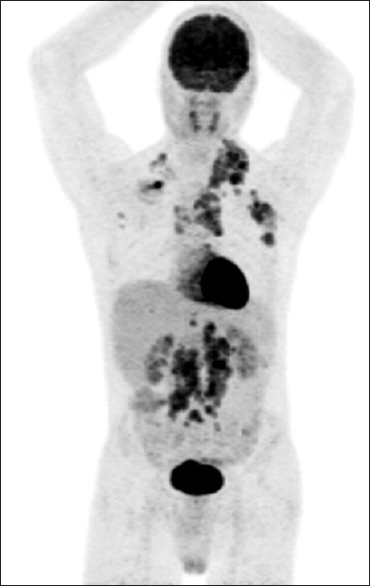 Positron emission tomography (PET) has been in use for a few decades but with its fusion with computed tomography (CT) in 2001, the new PET/CT integrated system has become very popular and is now a key influential modality for patient management in oncology. However, along with its growing popularity, a growing concern of radiation safety among the radiation professionals has become evident. We have judiciously developed a PET/CT facility with optimal shielding, along with an efficient workflow to perform high volume procedures and minimize the radiation exposure to the staff and the general public by reducing unnecessary patient proximity to the staff and general public. Recent studies have shown that there is a relationship between some inflammatory and biochemical markers derived from complete blood count (CBC) such as neutrophil/lymphocyte (N/L) ratio, platelet/lymphocyte (P/L) ratio, platelet distribution width (PDW), red blood cell distribution width (RDW), and coronary artery disease (CAD). The aim of this study was to determine N/L ratio, P/L ratio, PDW values, and RDW values, which are associated with myocardial perfusion in patients diagnosed with CAD. This study included 262 patients (149 with myocardial ischemia/infarction and 113 with normal myocardial perfusion) undergoing myocardial perfusion scintigraphy (MPS) with CBC within 90 days of MPS. Myocardial perfusion parameters such as summed stress score and summed difference score (SDS) were compared with N/L ratio, P/L ratio, PDW values, and RDW values. Neutrophil counts and N/L ratios were significantly higher in patients diagnosed with myocardial ischemia and/or infarct. However, there was no statistically significant relationship between myocardial perfusion abnormalities and P/L ratio, PDW values, and RDW values. This study showed that N/L ratio is related to myocardial ischemia/infarction and correlated to left ventricular ejection fraction (LVEF). We present the case report of a patient 83 year old female who developed progressive shortness of breath and subsequently underwent scintigraphic evaluation of her symptoms with a ventilation/perfusion scintigraphic exam. 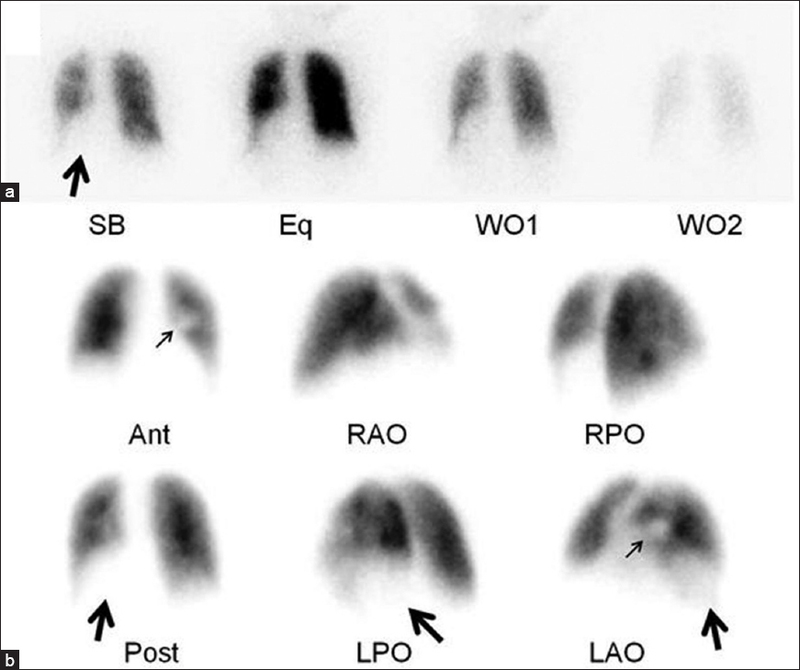 A matched perfusion defect was seen involving the basal segments of the left lower lobe. Following this, the patient was examined with a contrast enhanced CT of the chest to further investigate the defect, which revealed compression of the bronchi and vasculature of the left lower lobe basal segments by the hernia larger than the actual hernia. To our knowledge there has not been a case report of a large hiatal hernia as a cause of matched lower lobe defect. A 62-year-old male with a history of radical prostatectomy for a Gleason 9 (4 + 5) pT3N0Mx prostate cancer presented with rising prostate-specific antigen of 9.0 ng/dl. A contrast-enhanced computerized tomography (CT) revealed an enhancing left upper pole renal mass and aortocaval lymph nodes. Indium (In)-111 Capromab Pendetide (ProstaScint ® ) single-photon emission computerized tomography-CT showed abnormal increased uptake in left renal mass and aortocaval lymph nodes with no uptake in the prostate bed or pelvic lymph nodes. He underwent left radical nephrectomy and dissection of aortocaval lymph nodes. Pathology showed renal clear cell carcinoma and metastatic prostate adenocarcinoma involving aortocaval lymph nodes. Our case demonstrates a rare combination of two different malignancies, prostate cancer and clear cell renal cell cancer, showing In-111 ProstaScint ® uptake. Though ProstaScint ® uptake in renal cell carcinoma and in metastatic aortocaval lymph nodes from prostate cancer may be seen in clinical practice, this combination has not been reported previously. We present two cases of cerebral shunts - a ventriculopleural shunt and a ventriculoperitoneal shunt, with their associated complications. We also hope to provide a comprehensive literature review on various imaging modalities, including nuclear medicine studies in evaluating cerebral shunt complications. Rheumatoid arthritis (RA) is a chronic disease that is mainly characterized by the asymmetric erosive synovitis, particularly affecting peripheral joints. Radiation synovectomy or radiosynovectomy (RSV), also known as radiosynoviorthesis was first described in 1950's as an adjuvant treatment for RA. RSV is based on the irradiation of the joint synovium by the intra-articular administration of various β-emitting radiopharmaceuticals. As a generator-produced β-emitting radionuclide, the importance of rhenium-188 (Re-188) for radionuclide therapy is increasing rapidly. There are previous reports which used Re-188 tin colloid in knee joint synovitis, but use of Re-188 tin colloid in small joint is not yet reported. 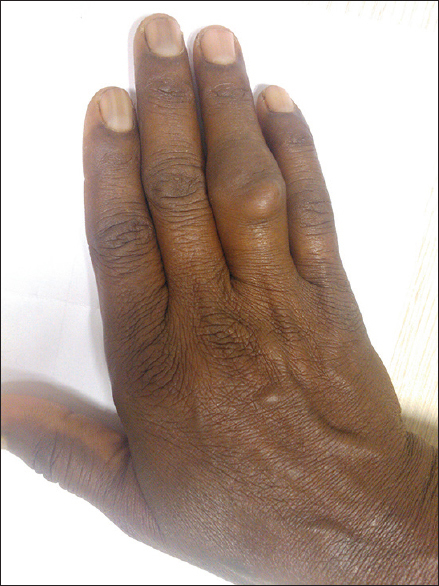 We describe the use of Re-188 tin colloid in a 45-year-old female who presented with right 4 th proximal interphalangeal joint synovitis due to rheumatoid arthritis. The prevalence of bone metastases from colorectal cancer (CRC) is quite low and the presence of isolated osseous metastases at the time of diagnosis or the onset of bone metastases without other organ involvement during follow-up is even lower. 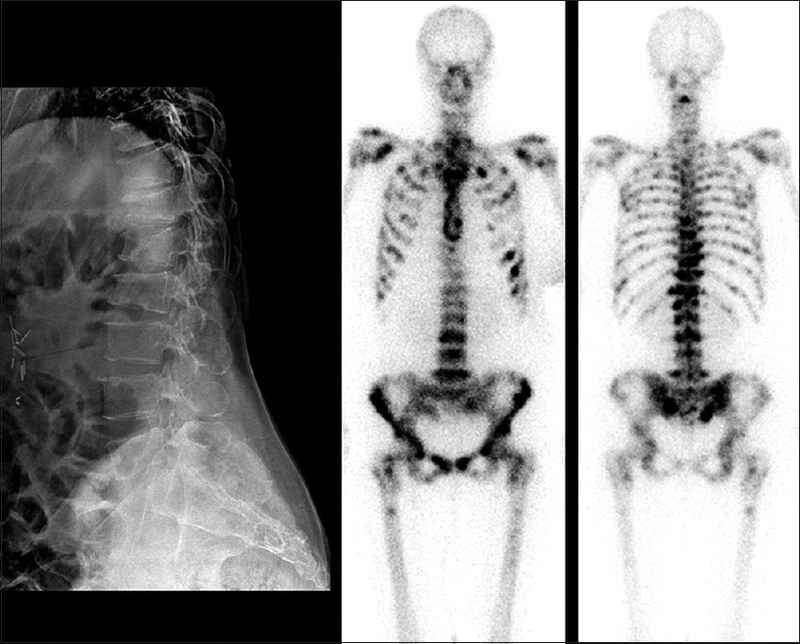 Here, we present an interesting case of diffuse skeletal metastases from CRC in which both the atypical presentation of the metastatic spread and the presence of infective comorbidities created some troubles in getting the final diagnosis. The patient was a 46-year-old Asian male diagnosed with lynch syndrome associated colon adenocarcinoma in the right ascending colon. A presurgical staging 18-fluoro-deoxyglucose-positron emission tomography/computed tomography (FDG-PET/CT) found increased metabolic activity in the cervical, axillary, mediastinal, supraclavicular, para-aortic and mesenteric lymph nodes. This pattern of metastasis was very unusual for lynch syndrome associated colon adenocarcinoma and the involvement of those lymph nodes resembles the pattern of spread of lymphoma. He underwent right hemicolectomy and he was subsequently treated with 12 cycles of folinic acid (leucovorin), fluorouracil (5-FU), irinotecan. A restaging FDG-PET/CT at the end of the chemotherapy showed interval decrease in size and metabolic activity in the affected lymph nodes. FDG-PET/CT is a useful imaging modality in following-up the treatment response in colon adenocarcinoma.